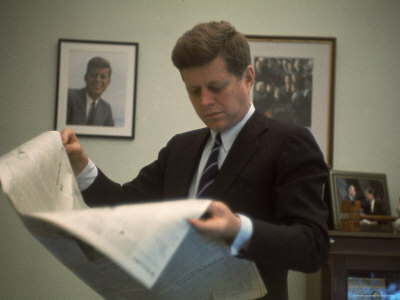 When I was writing my biography of John F. Kennedy, I was naturally drawn to the stories about the role of books and reading in Kennedy’s life. He was a dedicated reader. One of my favorite stories is about a day during his 1960 presidential campaign when, after a full day of campaigning, he sat down on the plane and began to read Benjamin Franklin’s autobiography. That’s commitment. It makes the President so human, doesn’t it? Here’s this man with the fate of the world (literally) in his hands and he makes time to read. I thought of all those people who say they don’t have time to read. Really? It also makes me think about reading as necessary. Not a luxury, but as something vital to the way we view ourselves and the world. Think of all the books President Kennedy must have read in his brief life and how they formed his understanding of people and places. He wasn’t taking time away from anything. His love of history gave him perspective so that he was able to take a long view when it was necessary. Most of us don’t face such urgent and potentially life-changing decisions every day, but we do make choices about how to treat one another, how to approach our work, and what to have for dinner. Making time to read something good not only enriches our lives, but it’s also a workout for our brains and makes us more empathetic. Of course, a good (and easy) cook book can help with the decision about dinner!